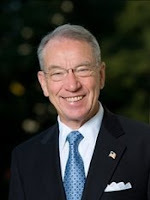 Iowa Senator Charles Grassley went to the senate floor this week to respond to the ethanol smear campaign orchestrated by the Grocery Manufacturers Association. "But, as was recently reported, this anti-ethanol campaign is not a coincidence. It turns out that a $300,000, six-month retainer of a beltway public relations firm is behind the smear campaign, hired by the Grocery Manufacturers Association. I think it’s important for policy-makers and the American people to know who’s behind this effort. According to reports, downtown D.C. lobbyists, the Glover Park Group and Dutko Worldwide, are leading the effort to undermine and denigrate the patriotic achievement of America’s farmers to reduce our dependence on foreign oil while also providing safe and affordable food." The senator went on to detail the plans put together by the GMA and a high-priced DC public relations group to oppose the American-grown renewable fuel industry. He also made the original documents available.